Hello, I am the owner of KD Grooming Studio. I have been grooming since 2002. I started my career as a work experience student in a well respected grooming and training school, in conjunction with an animal care course. I was soon offered a job as a bather, and then went on to complete my Level 3 in Dog Grooming and Teacher Training so I could help with teaching the students. I went on to gain my LCGI (Licentiate of the City & Guilds Institute) and complete my Higher Diploma in Dog Grooming, becoming a master groomer in between having two children. After nine years in my well loved job I decided to take on a business partnership and I am now the proud owner of KD Grooming Studio where I hire 6 amazing staff. My love for the job also spills over into my home life where we own a Bedlington Terrier named Vivian, a Miniature Poodle named Grantham and a Pekingese named Mr Pickles. We also have a cat, goat, horses, tortoises and rabbits! I enjoy entering grooming competitions with my Bedlington and am always attending seminars and workshops to keep up with growing and ever-changing trends in the grooming industry. Lisa enrolled on a dog grooming course in 2013 after showing huge interest in the grooming industry. Her love for dogs has been apparent from child hood, as her parents bred and showed boxers for many years. As a teenager she used to show her parents dogs and worked in kennels. Lisa was the Manager of a health food store, Earthfare, in Glastonbury for 10 years and has now put her skills to use as Manager here at KD. She has completed her full Level 3 City and Guilds Qualification and is working towards her Higher Diploma. 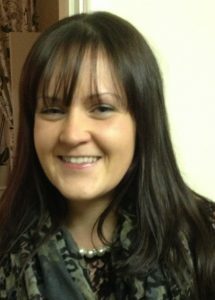 She gained her teaching qualification in January and thoroughly enjoys attending grooming competitions. Lisa is an Animal First Aider and she owns a Toy Poodle called Pringle. Lucy was a student at KD and developed such good grooming skills that I decided to offer her a position at KD. She has completed the full Level 3 C&G Dog Grooming Qualification, holds a teaching qualification and is now working towards her highers. Lucy is our senior groomer, helps with admin, teaching and invigilating. Lucy is an Animal First Aider who has competed at Crufts this year and won 2nd place in the Young Kennel Club Groomer of the year! She also won 1st place in the Young Kennel Club Jumping final and 3rd over all in the jumping competition with her own dog Mollie. (Pictured right with Fudge and Fin) She is a very keen competitor in agility and competes solely with Mollie now after retiring her beloved Fudge recently. Lucy plans to attend more competitions this year. Gemma has always had a love for animals, especially dogs from a young age. She enrolled on the Level 3 Introductory Dog Grooming Course at KD in June 2013 after completing the Level 3 Extended Diploma in Animal Management at College. Gemma gained the full C&G Level 3 Diploma for Professional Dog Stylists and is now working towards the higher diploma. She loves learning and developing her skills by attending seminars, demonstrations, workshops and entering grooming competitions. Carly comes from an education, events and marketing background and has been working as a Business Developer for the past three years with some very reputable companies in Bristol. Kelly and Carly have known each other for years and have regularly made plans to take over the world. Carly and her Labrador Marley absolutely love coming to work. The queen of admin wears many different hats at KD from teaching, marketing, events managing Supergroom South West to helping with the overall business development. No job is too big for this lovely lady!! We work together with Somerset and Dorset Animal Rescue Centre by grooming their rescue dogs for free. Kelly dedicates her spare time as a Trustee Little Gem’s Rescue. The charity was established in 2011 by Thelma Hanford as a rescue and safe haven for mistreated, unloved and unwanted Shetland ponies. As the need for animals to be rescued has increased over the years Thelma expanded Little Gems on to rescuing a wider variety of animals other than just Shetland ponies. Now Little Gems Rescue has horses, ponies, goats chickens and other farmyard livestock.